Bureau of Energy Efficiency (BEE) is a statutory body under the (Ministry of Power, Government of India) established under provisions of the Energy Conservation Act 2001, to promote efficient use of energy and its conservation. 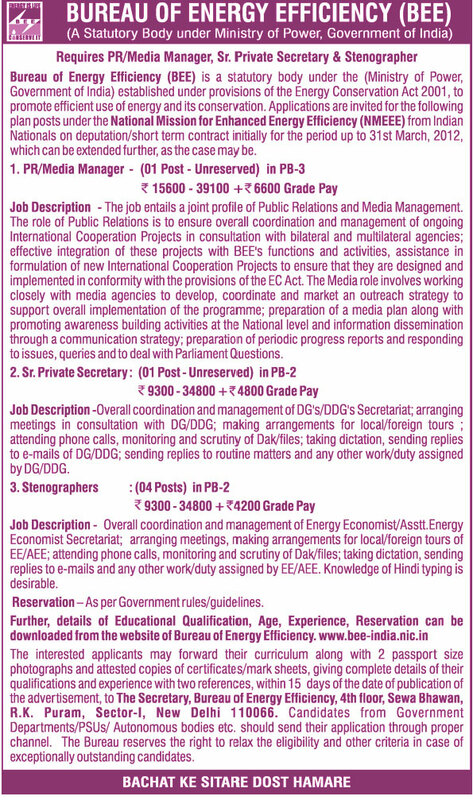 Applications are invited for the following plan posts underthe National Mission for Enhanced Energy Efficiency (NMEEE) from Indian Nationals on deputation / short term contract initially for the period up to 31 st March, 2012, which can be extended further, as the case may be. Further, details of Educational Qualification, Age, Experience, Reservation can be downloaded from the website of Bureau of Energy Efficiency, www.bee-india.nic.in The interested applicants may forward their curriculum along with 2 passport size photographs and attested copies of certificates / mark sheets, giving complete details of their qualifications and experience with two references, within 15 days of the date of publication of the advertisement (from 16.10.2010), to The Secretary, Bureau of Energy Efficiency, 4th floor, Sewa Bhawan, R.K. Puram, Sector-I, New Delhi 110066. Candidates from Government Departments/PSUs/ Autonomous bodies etc. should send their application through proper channel. The Bureau reserves the right to relax the eligibility and other criteria in case of exceptionally outstanding candidates.